Tired of running back to the kitchen all the time for clean dishes? 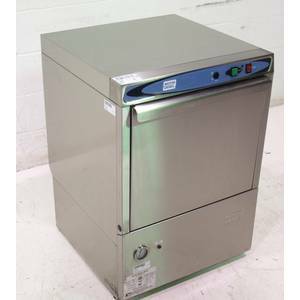 A commercial undercounter dishwasher can be a fantastic option for small dining facilities and bars. These compact bar dishwashers make it possible for bartenders to quickly and easily clean their used dishes so fresh ones are always on hand during peak hours. Moyer Diebel (201LT) – 21 Rack/Hr Undercounter Dishwasher – NEW, Floor Model. The 21 rack-per-hour Low-Temp Undercounter Dishwasher (201LT) is an innovative, new under-counter dishwasher by Moyer Diebel. Its perfect for daycares, cafés and small bars thanks to its incredible performance and energy efficiency. In fact, the dishwasher is equipped with a wash tank heater that ensures the wash water is consistently at approved temperatures. Convenient, top-mounted controls are easy to use and, and best of all, its stainless steel construction is incredibly strong and durable-its virtually corrosion proof. Dirty dishes in one side, clean ones out the other! Single rack and double rack dishwashers Save space and labor. They quickly and efficiently wash and sanitize dishes so you can continue to pump out delicious meals!